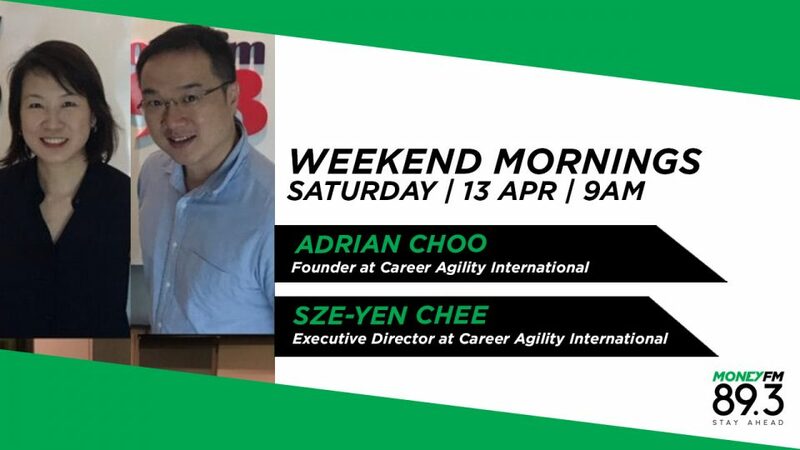 On #WeekendMornings, join the conversation with Adrian Choo Founder at Career Agility International amd Sze-Yen Chee, Executive Director at Career Agility International as they discuss about the 7 proven secrets to land your dream job. "Fake it till you make it" and "follow the money" are among the worst career advice you could get, according to Career Agility International's Adrian Choo and Sze-Yen Chee. They give their top-five worst list in our weekly career segment. The conversation continues with Career Agility International's Adrian Choo and Sze-Yen Chee, as they give their top-five pieces of career advice to super-charge your work life. Career Agility International boss Adrian Choo shares five things to consider before accepting leadership roles in ASEAN nations, and within other emerging markets. After all doors were closed to him in Singapore a decade ago, Jason shares with Career Agility boss Adrian Choo how he moved to Malaysia for his next professional step in our ongoing Career Resilience series. Career Agility International's Adrian Choo & Sze-Yen Chee share five things to consider when failed with the choice of either a severance package or a different role in your company when the heart can overrule the head. In a 40-year working life, Jason has been laid off three times. In the latest in our Career Resilience series, Career Agility International's Adrian Choo & Sze-Yen Chee hear how Jason dealt with each of his apparent professional setbacks. Career Agility International experts Adrian Choo and Sze-Yen Chee share five tips to accelerate your career towards 2020, including the need for older workers to upgrade their skills in an ever-changing workplace. In our continuing series on resilience in the workplace, Jason tells Adrian Choo and Sze-Yen Chee of Career Agility International of the challenges and decisions he faced as he left CNN to move to Singapore in 2001. With the new decade only a matter of months away, Career Agility International founder Adrian Choo shares how to have 20-20 vision for any upcoming employment interview to ensure the perfect job for 2020. In our latest segment on career resilience, Jason shares with employment guru Adrian Choo how he fulfilled his dream of being a CNN anchor, five years after being told he'd never work for the network. Our in-house expert Adrian Choo introduces his executive director Sze-Yen Chee as Career Agility International moves into new offices at Clifford Centre, with the aim of providing guidance to high-level Singapore professionals. In our new series on career resilience, Jason explains how he overcame countless setbacks to become a BBC TV presenter in 1994 to Career Agility International's Adrian Choo and Sze-Yen Chee. How to stay resilient in today's challenging corporate world? Career Agility International boss Adrian Choo gives five keys to stay tough, despite upsetting setbacks on the job. Building on Adrian Choo's five tips for career resilience, Jason shares secrets of staying employed during his 40-year career, including striving of consistency in the workplace to gain trust of colleagues. Career Agility International boss Adrian Choo turns interviewer as he asks Jason about his experiences in creating his own portfolio career, having been laid off from his permanent job a year ago. The conversation with Career Agility International boss Adrian Choo continues as Jason shares five things that helped him create his own portfolio career in his 50s, including being prepared to learn new skills and adapt old ones. On Weekend Mornings, regular guest, Adrian Choo, Founder at Career Agility International as he shares five tips for millennials entering the workforce. Inspired by a 22-year-old British woman who turned down an entry-level job after being savaged into the interview, Career Agility boss Adrian Choo gives his five tips for Millennials entering the workforce. Inspired by the popularity of Japanese 'tidying up' author Marie Kondo, corporate coach Adrian Choo gives five tips to #KonMarie (clean up) your career for the Year of the Pig. The career conversation continues as Jason offers his own five ways to clean up your career, including cutting down on social media while at the workplace and staying hydrated in the office. Glenn van Zutphen talks with The Career Strategist Adrian Choo about his five tips to get ready for the beginning of the hiring season in Singapore in February and how to beat the competition for a great job. Adrian gives his tips on how to re-enter the workforce after someone has taken time off to pursue other interests. Even if you've hit rock bottom in your job, there's always a way back, says corporate coach Adrian Choo as he gives five tips to revive your career in 2019. In part two of our chat, Jason gets Adrian's feedback on his own, more holistic tips to revive your career when you think you've hit rock bottom. With the benefit of hindsight, what do you wish you knew when you entered the workforce? Career Agility International boss Adrian Choo gives five pieces of advice to his younger self. The conversation continues as Jason gets Career Agility International boss Adrian Choo's feedback on the five things he wish he knew when he started his professional journey almost 40 years ago. Having executive presence can mean the difference between getting a job promotion and missing out, says Career Agility International boss Adrian Choo, who shares 5 ways to enhance your corporate image. In part two of our career chat, Jason gets Adrian's feedback on his own keys to building your executive presence, including knowing your audience and being honest and self-deprecating when appropriate. Career Agility founder Adrian Choo lists five useful tips for employees when they unexpectedly find themselves working for a new boss. The conversation with Career Agility founder Adrian Choo continues as Jason weighs in with suggestions about how senior staff can make their mark with a new boss. Adrian Choo, of Career Agility International, lists five ways to achieve career happines for workers. From entry level to top executives, it is all about perspective, planning and seeing the big picture. The conversation continues as career expert Adrian Choo gives his feedback on Jason's five ways to achieve job happiness in the cut-throat and competitive world of media. What are the red flags to watch out for when contemplating your next professional step? Career coach Adrian Choo, of Career Agility International, lists five warning signs in job interviews. The conversation continues as Jason gives his own five warning signs, including the story of a prospective employer which asked him to go on a business trip for free before he'd come on board as an employee. Corporate coach Adrian Choo, founder of Career Agility International, shares five warning signs that it is time to take stock and slow your career down. The conversation with corporate coach Adrian Choo continues as Jason gives his own five signs that it is time to slow down in your career, or take a step back, including when you no longer recognise yourself in the mirror. Corporate coach Adrian Choo, of Career Agility International, lists five employee practices that are no longer beneficial in today's Singapore work place in our weekly Career Crossroads segment. The conversation continues with Adrian Choo, founder of Career Agility International, as Jason gives his own five examples of outdated work practices, including boozy lunches in his hometown of Sydney from the 1980s. Is it a step up or a step towards the exit? Career coach Adrian Choo outlines the pros and cons about accepting an internal transfer at work. The conversation continues as Jason shares his personal stories with corporate coach Adrian Choo of when moving overseas has helped his career -- and how an aborted move set him back. Career coach Adrian Choo gives five reasons why your job search isn't going well and suggests ways of ensuring you take the next step in your career. Career coach Adrian Choo shares tips on how to extend your stay in a job when a company is cutting back. Corporate coach Adrian Choo recommends five people for your work inner inner circle in the Career Crossroads segment. Career coach Adrian Choo and Jason continue the conversation on 5 signs you are in the right job. Career Coach Adrian Choo's 5 tips on how to deal with a toxic co-worker. Adrian Choo, career coach gives us 5 attributes of the modern manager. Does Being A Good Samaritan In Business Pay Off? Adrian Choo, Career Coach shares 5 points on whether being a good Samaritan in business pays off. Adrian Choo of Career Crossroads returns to chat with Jason on the dos and donts of leaving a job. Adrian Choo: Do Nice Guys Finish Last In Business? Do nice guys finish last in business? Career Coach Adrian Choo gives us his take on this. Adrian Choo, career coach and author of Career Crossroads returns to chat with Jason Dasey. In this week's episode, he shares tips for workers at the ages of 45+ & 55+. In this week's episode, Adrian Choo shares the five best ways for executives to prepare for a job interview. On this week's episode of Career Crossroads, we speak with Mr Adrian Choo, Career Coach on the 5 ways to fastrack a promotion. Adrian Choo, author of Career Crossroads book and corporate coach, for Career Crossroads segment. He spoke with Justin on the 5 things to do when you have a difficult boss. On this segment of Career Crossroads, Jason spoke with talent acquisition strategist Adrian Choo, author of Career Crossroads. Listen for useful career tips for mid and upper level professionals.